1. Put the potatoes, bay leaves and a pinch of salt in a large pan; cover with cold water and bring to the boil. Simmer for 15 minutes,until just cooked through. Leave to cool in the cooking water whileyou prepare the remaining ingredients. Bring another pan of water to the boil. Boil the cabbage for 2 minutes, then drain; set aside. 2. For the hollandaise, boil the wine, vinegar, shallot, thyme and peppercorns together until reduced to 1 tbsp. Sieve; discard the solids. Put the egg yolks in a blender and, with the motor running, pour in the hot reduction and then the melted butter in a thin stream. Season with salt and the lemon juice; stir in the mustard. 3. Preheat the grill to high. 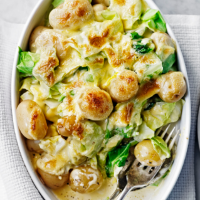 Drain the potatoes and arrange in a serving dish with the cabbage; spoon over the hollandaise. Place under the grill, watching carefully, until glazed and golden – about 2 minutes. Serve with sliced ham, fish or smoked meat.